Windows users save their valuable data, files, and folders on their computer. Though we carry our smartphone for daily usage, we store important docs and files on our computer. When there is a need, we could easily check for the files on PC. All the files are saved in the internal hard disk. Installing fake and non-trusted software can trouble your system. The unverified programs could damage the hard disk which makes it non-functional. Computer users first avoid installing cracked or pirated applications. You may get benefit out of the patched program but remember that you're giving a doorway to corrupt your data. To keep your valuable files safe, you should have a disk backup without fail. In the case of hard disk failure or system fault, a backup can solve your problem. In Windows PC, you can make a system backup. If you're unaware of this, check out by going to Start > Control Panel > System and Security > Backup and Restore. You can backup and restore your system and files using these built-in features. There are many cons in the built-in feature. One of the cons is that you have to manually back up your system and files. Also, it doesn't offer partition and real-time file sync. To solve all these issues, you can use AOMEI Bakupper software. By using this software you can automatically backup files to an external hard drive. You could simply handover the backup task to this program to take care of your data in files, folders, system, and disks. In this guide, you'll learn how to automatically copy files to external hard drive. External Hard Disk with sufficient space to backup data. The AOMEI Backupper comes in two versions as we discussed above. The Standard Edition is Freeware which can be used commercially without the license. Download Free Backup Software from their official website. With this program, you can easily backup your system, disk, selected partition, file backup, and sync. System backup: The term System backup refers to a combination of copying all the system files, program files and boot files. i.e Backing up Windows system reserved storage. You have to do the system backup only when the operating system works normally. So, when you restore the system backup from an external hard drive, your computer will function as expected. Disk backup: When you do a disk backup, all the data including OS and installed programs will be converted to an image file. This image file can be used to restore using this same tool. Partition backup: Partition backup is nothing but backing up a specific partition. Example: Drive C, D or E. This particular volume of storage will be backed up to an image file. 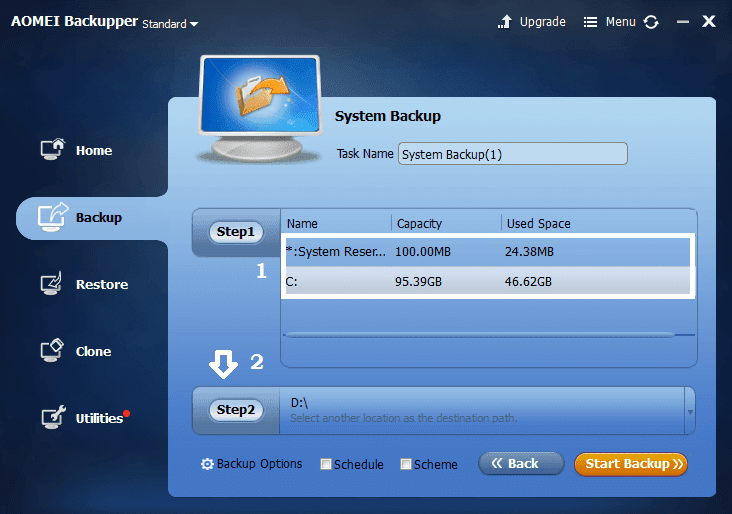 Similar to Disk backup, you can restore with the AOMEI Backupper. Files backup: As the name implies, it is the process of copying individual files and folder to external storage. Let's see what are the features available in the Pro version. Faster backup and restoration speed. You can restore the system to different computers. It supports Windows Server 2003, 2008, 2012, 2016, WHS 2011 and Windows SBS 2003, 2008, 2011 (all editions, including R2). Right-Clik on it and Run as Administrator. Try the Pro version or continue to install the free version by clicking the Skip option. Accept the license agreement and install the software. Before launching this application, ensure that you've connected your working external storage. Connect your hard disk to the computer using the USB cable. The UI of this tool is clean and cool. The navigation is simple to operate backup and restore options. 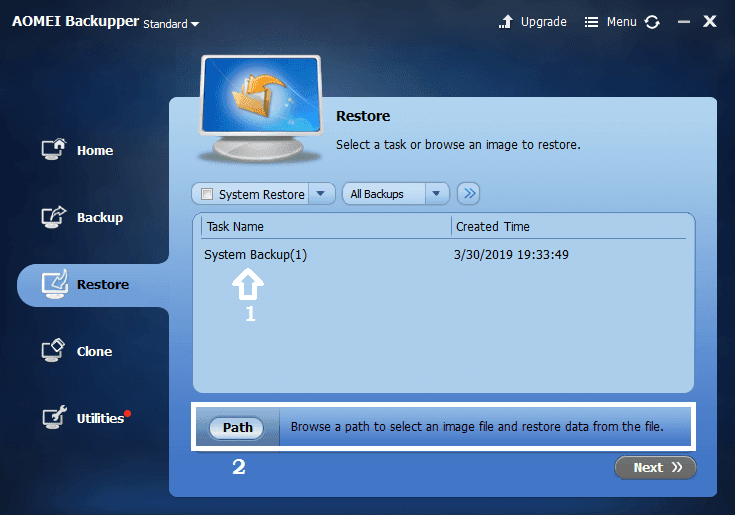 Click on Backup menu on the left pane or click on Create New Backup. Selected the System Reserved Storage or Drive C. (You can make backup one by one). 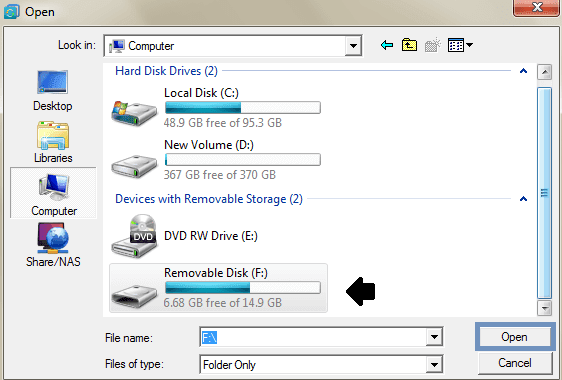 The second step is to choose the external hard disk as the destination. In my case, it is the Removable Disk (F:). Pick the external disk and click Open. Finally, click the Start Backup button. Click the Disk Backup option. The first step is to select the disk you want to backup. Since you're going to back up the internal hard disk, you've to choose Disk0. Choose the external hard drive in step 2. Click the Partition Backup option. Click Step 1 to choose your desired partition. Select the destinated hard drive in Step 2. Click File Backup from the Backup menu. Click Add File or Add Folder. Select the files or folders from Windows Explorer. Choose the external hard disk in Step 2. 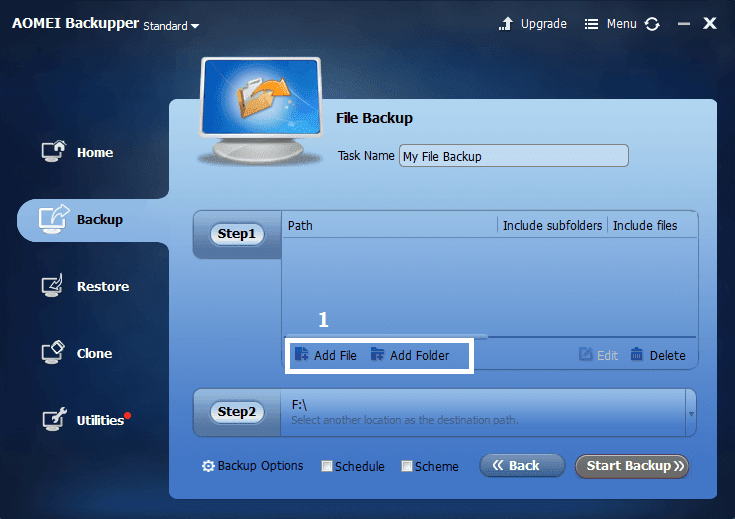 The automatic backup can be done by using the Schedule option. Each backup feature comes with schedule option. Whether it is system backup, disk backup, partition backup or files backup, you can schedule the task for Daily, Monthly and Even triggered mode. 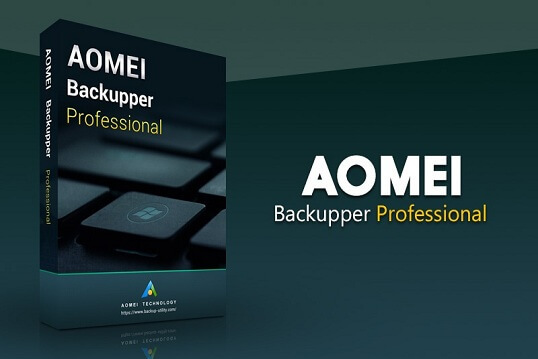 Check out this guide to learn more on automatic backup in AOMEI Backupper. Connect your external hard drive that has the backup. Launch the AOMEI Backupper tool on your PC. Go to Restore option from the left pane. Select the required backup as shown above. Browse for the image file to restore data from external drive by clicking Path. Choose Full Backup on the next screen. Note: Depending upon the size of the data, it will take time to backup and restore it. Do not shutdown your system during this backup and restore process. 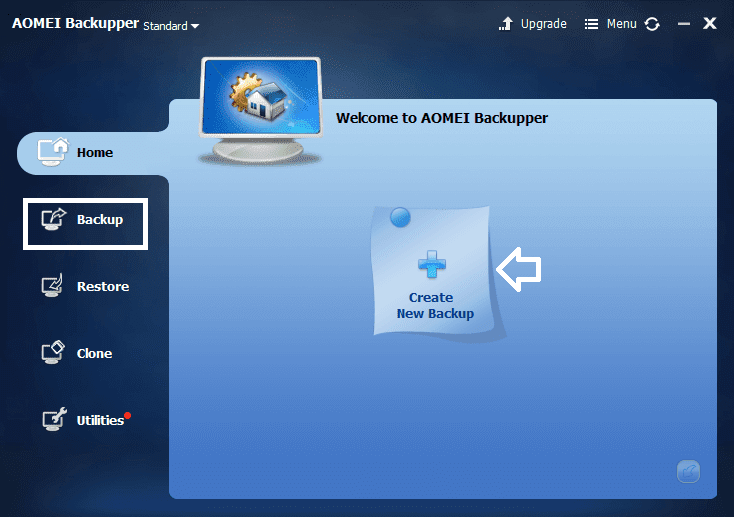 AOMEI Backupper is the best backup software for Windows. Most people use Windows 7 and 10 operating system for day-to-day use. Whether you're using your system for your personal or professional purpose, you must back up your data to protect your data using this tool. In addition, this software comes with the Clone feature. By using this feature, you can clone the Disk, System, and Partition from one hard disk to another. It has much more options in the Utilities section. I hope this helps. If you like this guide, Share it with your friends!